It’s January. After the holidays, resolutions still (marginally) intact, and nothing but Martin Luther King, Jr. Day and President’s Day to keep you going until the weather turns warmer. And even though we’ve had some milder weather this winter, it still means that the garden is pretty barren. And if you are like me, i.e., always looking forward to spring, this can be kind of disheartening. January is just far enough off from spring to really make it feel like it will never come. But January is the perfect time to start planning your spring and summer garden. You can sit inside nice and cozy reflect on how unsuccessful last year’s garden was and dream about how successful this year’s garden will be. So, how am I preparing? First, lessons learned from last year! 1) Tomato Thicket – Last year I got super duper excited and started my tomato plants from seed inside. This was great – I had a ton of tomato plants and they were super cute. So, of course, I couldn’t even consider not planting all of them. Alllllll 16 full sized tomato plants. In a garden bed that is 4 feet wide and 8 feet long. So I ended up with a tomato thicket. I couldn’t even reach the beautiful tomatoes in the back, and the plants grew so intertwined together that they couldn’t get enough light to actually produce a lot of fruit. This was my end of season I’m-taking-all-the-plants-out-and-calling-it-quits-harvest. 2) Compost – As a basis for a garden bed, compost is amazing. Those tomatoes, though completely a mess grew, and grew and grew and grew. 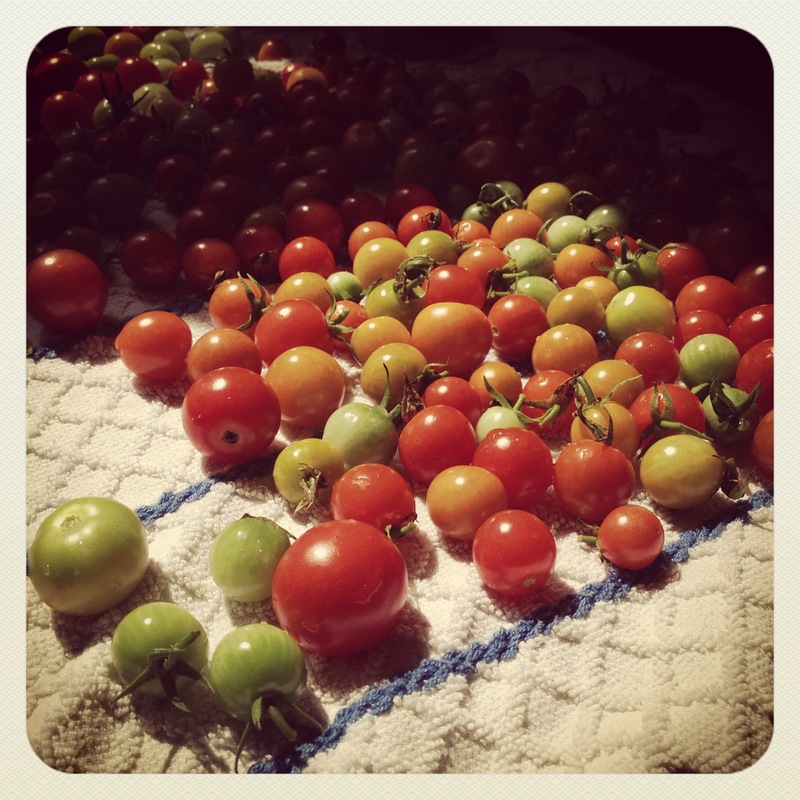 The tomatoes I was able to pick were beautiful, flavorful and awesome. And the compost was cheap – it cost about $50 for a half a truck load of the stuff, the garden center picked it up and dumped it into the back of the pick up truck for me and I just had to scoop it out into a wheel barrow, throw it in the beds and then turn the beds over. The only problem was that I had to borrow Mark’s truck to go get the compost – and then wash it. Thanks Mark! 3) Lettuce Alone – For me and J, growing lettuce was not a successful enterprise. First, the lettuce didn’t grow very well. I’m not sure if the soil drainage wasn’t right, or if sunlight wasn’t right, but the lettuce definitely failed to thrive. Second, we eat a ton of salads. The lettuce I was able to grow would not even have made half of one of J’s salads. I don’t think I’ll try lettuce again. The return on investment of time and garden bed space was pretty low. So, what am I going to try to grow this season? Stay tuned!